Daughter of the president of the Burgundy parliament, Jane Frances was born in Dijon, France. At the age of twenty, she married Baron Christopher de Chantal. The couple had seven children, three of whom died in infancy. Jane reestablished the custom of daily Mass in her castle residence and engaged in numerous charitable works. When her husband died in a hunting accident in 1601, Jane Frances sank into a depression. She and her children moved into her father-in-law's house when he threatened to disinherit her children. Despite his oppressiveness, she managed to regain her cheerfulness and raise her children in a happy atmosphere. When she was about thirty-two, Jane heard Saint Francis de Sales preach and recognized him from a vision she had earlier seen. Greatly affected by his words, she convinced him to become her spiritual director. Jane Frances indicated her desire to enter the Carmelites, but Francis de Sales convinced her that this was not her calling. A few years later, however, he explained to her his concept for a new congregation which he wished to found. This order would be open to women who, because of health, age, or other circumstances, could not enter the established orders. This order would undertake spiritual and corporal works of mercy and exemplify the virtues shown by Mary at the Visitation. Jane made provisions for her children’s care. She then, along with three other women, formed the first community of Visitation nuns. It was for Jane and her nuns that Saint Francis de Sales wrote his great spiritual classic On the Love of God. In the remaining three decades of her life, Jane Frances was active in spreading the order over all of France; more than sixty houses were founded in her lifetime. During the last years of her life, Jane suffered a spiritual dryness. She told Saint Vincent de Paul that her mind was so filled with all sorts of temptations that she had to strive not to look within herself. Despite this, Saint Vincent noted that "her face never lost its serenity, nor did she once relax in the fidelity God asked of her. And so I regard her as one of the holiest souls I have ever met on this earth." Jane Frances overcame these cares and worries by losing herself in God. “To live no more in oneself, but lost in God, is the most sublime perfection which the soul can reach,” was Jane Frances’ advice to those with misgivings and concerns. 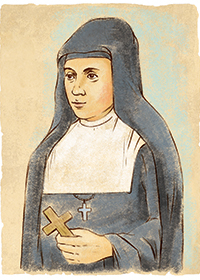 Saint Jane Frances de Chantal died on December 13, 1641 and was canonized in 1767. An optional memorial on August 18 honors her. Jane Frances' message today: All of us experience spiritual dryness at some point in our lives, a time when God seems to have abandoned us. Jane’s advice “to live no more in oneself, but lost in God,” offers wise words of counsel. We can persevere, as she did, in our faith life despite not feeling connected to God. Do you remain faithful to God even when life is routine and you feel a lack of spirituality in your daily existence? Remember that God doesn't turn away from you at any time.